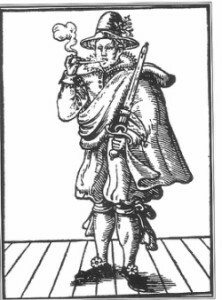 In 1583, Philip Stubbes argued that London’s theaters “maintain bawdry, insinuate foolery” and “induce whoredom and uncleanness.” Two centuries later, Samuel Taylor Coleridge referred to the sensational and controversial novel The Monk as “a romance, which if a parent saw in the hands of a son or daughter, he might reasonably turn pale.” Today, we have a rating system that gives age-based guidelines to movie-goers, and restricts access to R-rated films. The link between one’s behavior and the fictional worlds one encounters is a long-standing source of concern in Western culture. This writing-intensive class will examine poetry, drama, and novels by authors from Shakespeare to Ray Bradbury to consider the perceived threat of such literary “bad influences.”Along the way, students will become acquainted with the conventions of literary analysis and be asked to reflect on the writing process, engaging in reviews and revisions with the instructor and other students. By the end of the course, students will be able to identify different rhetorical situations and choose the best way to respond to them, integrating their own ideas with those of others and communicating those ideas in the appropriate medium and using applicable conventions for the genre. This course is an introduction to the study of literature with an emphasis on close textual analysis and the development of critical writing. Students will write in visual, oral, and electronic modes in addition to traditional college essays. As part of the Domain of One’s Own pilot projects, students will create a personal website or other web resource. Students will also write two explication papers, two analysis papers, and a research paper. Course texts include selections from poetry, drama, and fictional and nonfictional prose: the works of Marcus Aurelius, Ignatius of Loyola, William Shakespeare, John Milton, Eliza Haywood, Ray Bradbury, and Richard Rodriguez. We will also watch film versions of Macbeth and Fahrenheit 451 and consider students’ own selections from contemporary music, video games, and movies. Presentation signup begins on the class website at 8:00 a.m.
Thursday John Donne, “The Flea.” Christopher Marlowe, “The Passionate Shepherd to His Love.” Sir Walter Raleigh, “The Nymph’s Reply to the Shepherd.” Writing workshop. Thursday Finish screening of Macbeth. Discussion of film. Tuesday Presentation 3, Areopagitica. The Arian Heresy. Tuesday Presentation 5. Resisting Novels chapter on eReserves. Fantomina. Thursday Asynchronous Virtual Class: You will work from home today. Watch the Fahrenheit 451 movie (1966 version available to buy or rent on Amazon Instant). Email me 250-500 words exploring the differences between the film version and the novel by Friday at midnight. Tuesday Presentation 10. Discussion of Fahrenheit 451 film and novel. Tuesday Presentation 12. Weebly Workshop. Strategies for the annotated bibliography. Reading and Writing pages 130-165. Thursday Presentation 16. Writing Workshop. Autobiographical web project due. Satisfactory and timely completion of all written assignments. Shakespeare, William. Macbeth. Simon and Schuster, 2003. Rodriguez, Richard. Hunger of Memory. Random House, 1983. Bradbury, Ray. Fahrenheit 451. Simon & Schuster, 2012. Milton, John. Areopagitica. Wiley & Sons, 1951. Gardner, Janet. Reading and Writing About Literature. Bedford, 2012. Fahrenheit 451 film. Directed by François Truffaut, 1966. You have three excused absences (any absence may be excused provided that you contact me about it ahead of time by email). More absences (4-5) severely affect your attendance and participation grade. Six or more result in the lowering of a full letter grade each absence. Throughout the semester you will be asked to watch videos, look through websites, and read other online materials as well as complete textbook readings. Being well prepared for class means doing all of the readings, thinking about them, and having something to say about them during discussion. Summarizing each reading’s main argument and highlighting a few questions that it raises in your notes is a good way to come up with worthwhile things to say. For each class with an assigned reading, you are required to turn in a discussion question at the beginning of class. Students will present on one of three topics to be discussed in class. You will be using the PechaKucha format and creating a 20-slide, 6.6-minute presentation designed to incite discussion on the text or theme of the class period. Students will create a website using Weebly. You will post three mini-essays on the site about some object(s), event(s), person(s), or creature(s) of influence in your life. Students will write two 2-3 page explication papers. These papers should perform close readings of a passage from a song, poem, or work of drama or prose. Students will be expected to attend to the formal elements of language such as diction and syntax. Students will write two 4-6 page analysis papers, choosing among three different prompts. One of these papers will be developed into a final paper. Students will write an 8-10 page final paper, due the last day of class. It will represent a revision and expansion of an analysis paper, and will incorporate at least five secondary sources. Prior to the final paper, students must submit an annotated bibliography. “A” papers have an original and compelling thesis that is clearly articulated and supported effectively with relevant evidence. The structure is logical and engaging, and the paper is free from grammatical and mechanical errors. “C” papers have a thesis of average quality, an argument that is fully presented to the reader, but obscured by problems with grammar, mechanics, or organization. “D” papers have a poor thesis or do not have a thesis at all, lack organization and clarity, and contain many stylistic, grammatical, or proofreading errors. “F” papers have no thesis, poor organization, and many grammatical, stylistic, and proofreading errors. Essays should be submitted by email to dcoblen@emory.edu before class on the days they are due. Please use .doc or .docx format and enable “Show Markup” under the “Review” ribbon. Email is the best way to reach me with questions, 9-5 Monday through Friday. We will review and use MLA format for your essays. Essays should be in 12-point, double-spaced Times New Roman font. Because this is a workshop course, it’s important for you to be at every class meeting with your readings completed and your discussion question written. If you cannot meet a deadline you must contact me before the class in which it is due to discuss the situation. Each essay/exercise is to be turned in on time. For each class period late, a full letter grade will be lowered (i.e. by 10%) unless you have made prior arrangements with me. Because your written work will be based on extensive revision before the final grade is assigned, graded papers cannot be revised for a new grade. Arrive on time – excessive tardiness will affect your participation grade. You are welcome to use your laptop, but only use it for notes and other class-related things. Lower the screen during discussion. Exercise common courtesy such as paying attention when others are talking and not interrupting. Emory University complies with the regulations of the Americans with Disabilities Act of 1990 and offers accommodations to students with disabilities. If you are in need of a classroom accommodation, please make an appointment with me to discuss this as soon as possible. All information will be held in the strictest confidence. For more information, please visit http://www.ods.emory.edu/ or contact the office by phone at (404) 727-9877 [voice] or TDD: (404) 712-2049. Free and confidential counseling services are available at the Emory Counseling Center. This course is part of the Domain of One’s Own pilot project. You will build and maintain a personal website and compose with a variety of digital tools. No prior experience with web design or digital authoring is required for successful completion of course work. Your work will be published to the web and available to audiences beyond the class and university. The Emory Writing Center offers 45-minute individual conferences to Emory College and Laney Graduate School students. Our discussion- and workshop-based approach enables writers of all levels to see their writing with fresh eyes and to practice a variety of strategies for writing, revising, and editing. The EWC is a great place to bring any project—from traditional papers to websites—at any stage in your composing process. EWC tutors can talk with you about your purpose, organization, audience, design choices, or use of sources. They can also work with you on sentence-level concerns (including grammar and word choice), but they won’t proofread for you. Instead, they’ll discuss strategies and resources you can use to become a better editor of your own work. The EWC is located in Callaway N-212. We encourage writers to schedule appointments in advance as we can take walk-ins on a limited basis only. We require hard copies of traditional paper drafts and encourage you to bring a laptop if you’re working on a digital or multi-modal text. Please bring a copy of your assignment instructions, too. In addition to our regular conferences in Callaway, we host Studio Hours every Tuesday from 7-9 pm in Woodruff Library 214. Studio Hours provide a supportive, focused workspace and are open to all students. EWC tutors circulate to encourage writers, provide resources, and address questions. For more information about the EWC, or to make an appointment, visit http://writingcenter.emory.edu. If you are a multilingual student and English is not your first language, you may benefit from working with trained ESL Tutors. These tutors are undergraduates who will support the development of both your English language and writing skills. Like Writing Center tutors, ESL tutors will not proofread your work. Language is best learned through interactive dialogue, so come to an ESL tutoring session ready to collaborate! ESL tutors will meet with you in designated locations on campus for 1-hour appointments, and they will help you at any stage of the process of developing your written work or presentation. You may bring your work on a laptop or on paper. In Spring 2014, a new scheduling system called ASST will replace TutorTrac for ESL tutoring appointments. For instructions on how to schedule an appointment, links to ASST, and the policies for using the service, go to: http://college.emory.edu/home/academic/learning/esl/tutoring/index.html or contact Jane O’Connor, Director of ESL Services (jcoconn@emory.edu ) or Denise Dolan, Assistant Director of ESL Services (denise.dolan@emory.edu ). If you do not have a scheduled appointment, you may use the Academic ESL Skills Lab, located in Room 422 of Woodruff Library (next to the Language Center). Here, you may have less time with a tutor if other students are waiting, but you can find drop-in support just when you need it. To view the lab hours for the current semester, go to: http://college.emory.edu/home/academic/learning/esl/lab.html .